Four years after the new rules on challenging corporate resolutions were passed, a comprehensive group of experts has taken stock of the effects of the legislation, pending consolidation of the judicial opinions that have been gradually handed down during that time. The Garrigues Chair of the Faculty of Law of Universidad Pontificia Comillas (ICADE) played host to a number of top-flight legal speakers — professors, senior judges and lawyers — who, in their lectures, provided an in-depth insight into the key aspects of the legislation and its effects in practice. 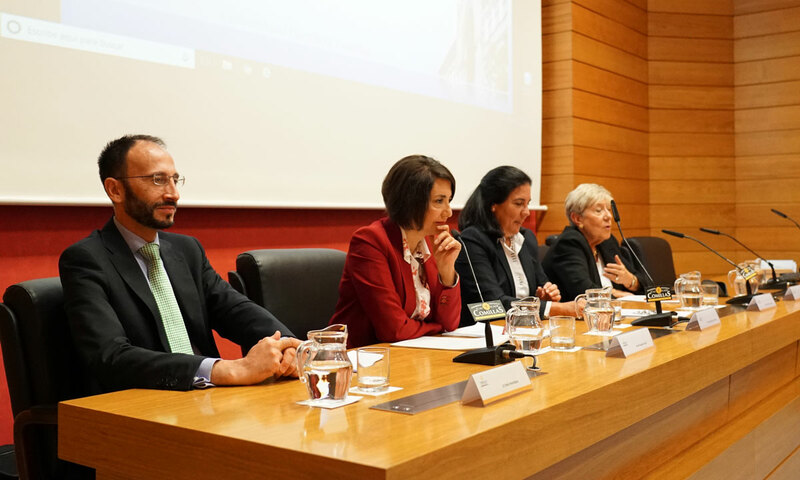 The workshop, which marks the relaunch of the Garrigues Chair, was opened by Íñigo Navarro, dean of the Faculty of Law (Comillas ICADE), and featured Mónica Martín de Vidales, joint director of the Garrigues Chair, and Álvaro López-Jorrín, joint partner in charge of Garrigues’ Corporate/Commercial Law Department, as moderators. The inaugural lecture, given by Fernando Vives, Executive Chairman of Garrigues and lecturer at the Faculty of Law of Comillas, focused on the shortcomings of the previous legislation and on the proposal of the Expert Committee, of which he was a member, which advised lawmakers in this area with a view to addressing regulatory needs. As Vives pointed out, there was a clear consensus on the need to carry out the reform, with attempts being made to incorporate settled principles deriving from the case-law, and a closer look was taken at the situations where discrepancies were present. He recalled that the legislation came into being after repeatedly failed attempts at harmonization by the European Union (EU). He emphasized that, although there are currently no specific rules on challenging corporate resolutions at European level, it seems clear that the general approach followed by the EU was guided by concerns for stability and the upholding of corporate resolutions. Vives made it clear that this is evidenced by a number of legislative efforts, also in other areas of EU regulation, such as that relating to challenges to corporate mergers. Ángeles Alcalá, a professor at Universidad de Castilla-La Mancha, underlined that Spain currently has a very forward-thinking and advanced set of legal rules on challenges to corporate resolutions, which incorporates all of the relevant case-law of the Spanish courts but which also features new developments that will have to be delimited and interpreted by the courts. During her lecture, she paid particular attention to the situations in which corporate resolutions are excluded from challenge, with emphasis on the dilemma between the maintenance of legal certainty and market protection vis-à-vis shareholder protection. She also discussed the rules on relevance and resistance when limiting the circumstances in which breach of the rules may result in corporate resolutions being challenged. In her view, a fundamental doubt arises in relation to notional meetings, which in many cases have been held to be contrary to public policy and are one of the most-litigated issues. Finally, Ángeles Alcalá stated that, in her opinion, treating an infringement of the right to information enjoyed by shareholders as a ground for challenge has rendered the right to information virtually devoid of content. Carmen Alonso Ledesma, a professor at Universidad Complutense de Madrid, considered that while the reform of the legislation concerning challenges to resolutions has some very positive aspects, it also has a number of drawbacks, mainly because the legislative technique used is not, as she puts it, as good as might have been hoped for and contains some elements that are difficult to give practical shape to. She pointed out that since the courts have not yet had sufficient time to take a view one way or the other, it is impossible to predict whether, in the future, the reform will be up to scratch, or whether, on the contrary, we will have to go back to using Article 7 of the Civil Code in the case of abusive resolutions. It was also flagged up during the workshop that the reform of the commercial legislation governing challenges to corporate resolutions has had a very significant impact in the procedural field. This was underlined by Antonio Entrena, a partner in Garrigues’ Litigation & Arbitration Department, who pointed out that many areas of procedural law have been directly or indirectly affected by the reform. He highlighted three main affected areas: (i) the changes to shareholders’ standing to challenge corporate resolutions, in particular direct standing; (ii) the establishment of what is known as ‘ancillary matters subject to a prior ruling’ in order to screen out the grounds which may be considered, a priori, not to be sufficiently relevant for the purpose of challenging resolutions; and (iii) the procedural implications of the new rules on the substitution of resolutions, where substitution or correction occurs after a lawsuit has been filed. On that last point (procedural implications where correction occurs after a lawsuit has been filed), María Teresa Martínez, a certified professor at Universidad Complutense de Madrid, stated that the reform avoids and puts an end to unnecessary processes as early as possible, saving in the costs and uncertainties associated with such proceedings as soon as it becomes apparent that there are no grounds for striking down the resolution that will no longer produce effects because it has been regularized by a later resolution. The judiciary’s perspective was provided by Andrés Sánchez Magro, a senior commercial judge, who examined issues relating to the enforcement of judgments upholding a challenge. In his lecture, he recalled that the rules prevent the courts from supplanting the will of companies and put on the table for discussion some questions arising from the issue of registering at the Commercial Registry the cancellation of corporate resolutions, as an effect of a court decision.